What’s new in Cumul.io this month? We pushed some exciting new updates in March, so we won’t keep you waiting any longer. Read on to explore all the new features that were added to our platform! Filter linked datasets with ease! Have you ever built a dashboard that combines data from multiple datasets? Filtering these dashboards has never been so easy! Thanks to dataset linking, you could already link 2 separate datasets on a common value. For example, if you have customer data in 1 dataset, but sales data in the other, you can link them in Cumul.io on a common customer ID. In that way, you can easily analyze your sales per customer! Now, what would happen if you started filtering that dashboard? To make this as smooth as possible, we added linked filtering to our platform! Basically, it means that if you filter on data in dataset A, the data of dataset B will automatically adapt. Let’s illustrate with an example. Now, what if we want to see the number of customers from each channel, but only for 1 specific product? Go ahead and click on ‘Damflex’ & ‘Freshzap’. As you see, the second chart adapts to the filter of the first chart. Even if they use 2 different datasets, the filtering will work across these datasets when they are properly linked. 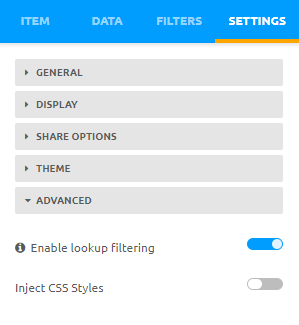 Once you’ve linked your datasets together, you just need to toggle the bar in the settings of your dashboard to enable linked filtering. For a step-by-step guide on linked filtering & how to link your datasets together, check out our Academy article. Let the filtering fun begin! We’re excited to announce our partnership with Panoply! Panoply is a smart data warehouse, which you can use to gather & combine data from all of your data sources without coding. And with our new Panoply connector, you can visualize all of that data directly in Cumul.io! Imagine you want to gather data from your marketing tools, sales tools and your own database in 1 place. With Panoply, you have access to over 100 data integrations. Select your data sources and start uploading them to Panoply with a few clicks! Panoply simplifies raw data into clear, clean tables. Thanks to their automatic data modeling, Panoply makes the data completely ready to be used in your Cumul.io dashboards. You never need to worry about database challenges such as storage or query speed again! The advantage of using Panoply with Cumul.io is that you can go from raw data, fragmented across different tools, to visual & interactive dashboards without having to write a single line of code. Select your data, connect your Panoply warehouse and start dragging & dropping to build your first dashboard! If you’re looking to offer dashboards to your customers embedded in your platform or customer portal, Cumul.io’s flexible integration & Panoply’s optimized data warehouse are the perfect combination. It offers a performing, visually attractive solution, yet it requires a limited amount of technical set-up. It will save your development team countless hours of valuable time. Data tables are a great chart type to compare data & detect trends. It’s especially helpful if you want to drill down into a specific part of your data. Below, you can see a plain data table that shows you the yearly revenue of all your products. Wouldn’t it be great though if you could make this even more visually readable? Now you can, thanks to conditional formatting! With conditional formatting, you can highlight values that meet certain criteria, using colors or bars. Below you’ll find the same data table, but with some conditional formatting magic added to it. The revenue column now contains conditional colors. Depending on how much revenue was generated compared to the average yearly revenue, the values will get a different color ranging from red (bottom 25%) to green (top 25%). Because the category ‘Year’ also has a fixed color per year, it becomes much easier to compare the sales of different products in that same year. And there’s much more to discover! Do you want to learn more about the conditional formatting options in data tables? Check out our Academy article to learn everything you need to know. Play around with these new features! Can’t wait to start using these new features? Go to Cumul.io and add a data table to your dashboard, connect new data sources via Panoply or start filtering your linked datasets!